A fissure is a narrow and long crack or opening, usually in a rock face. Interstitial pertains to a narrow opening or a crack between two things. A sponge is a porous or absorbent material because it can soak in liquid into itself. Its porous body, which has many holes, allows water to penetrate it. The sponge’s porous bodily material, filled with pores, allows liquid to pass through easily, and so is often used for cleaning purposes since it also retains water. Quiz: Try again! What is a porous material? It has many holes which allow liquid or gas to pass through. It is a material that comes only from the world’s oceans. It is a smooth, flat surface which allows water to collect on top of it. A porous substance has holes through which liquid can be absorbed, such as a sponge. Poor Us When our city's dam was getting older it became porous, leaking so badly that the city was often flooded--poor us! 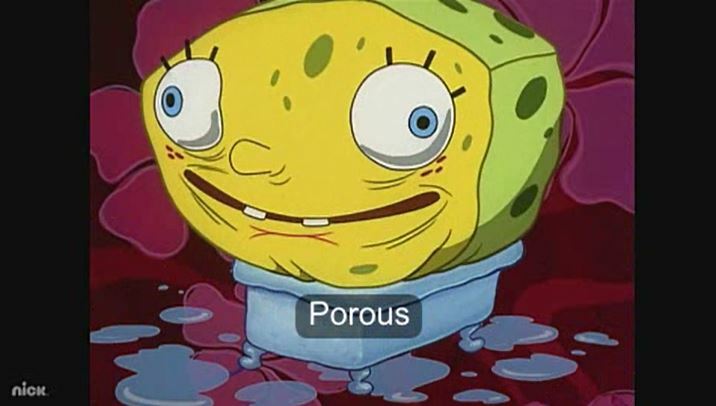 A porous substance “possesses the nature of a passage or way,” which means that it has “ways” or “holes” in it through which substances can pass. SpongeBob Squarepants Absorbent and yellow and porous is he!